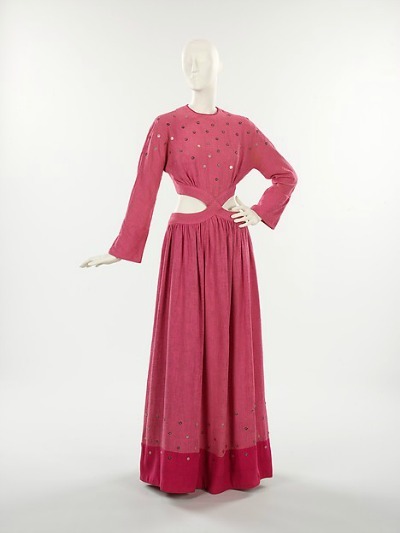 As with many fashion designers, American costume and sportswear designer Bonnie Cashin's creativity was inspired and encouraged by her mother. She explains her interest in fashion, "My mother was a dressmaker and before I could write, I could sew." Cashin learned to design clothing that flattered bodies in motion while designing costumes for the Roxyettes at The Roxy Theater in New York City. Her work caught the eye of a Harper's Bazaar editor who introduced her to the suit and coat manufacturer Adler & Adler. She worked for them for five years before accepting a commission to design uniforms for the United States' women's armed forces. Her utilization of leather, canvas, toggles, and industrial-strength zippers in her uniforms became inspiration for her sportswear designs. In 1942, Cashin moved to Hollywood where she took a job as costume designer for Twentieth Century Fox. In the seven years she was with the studio, Cashin created costumes for over sixty films including Anna and the King of Siam, A Tree Grows in Brooklyn, Give My Regards to Broadway, and Laura. Bonnie Cashin's style was most apparent with Gene Tierney's costumes for the 1944 film Laura. 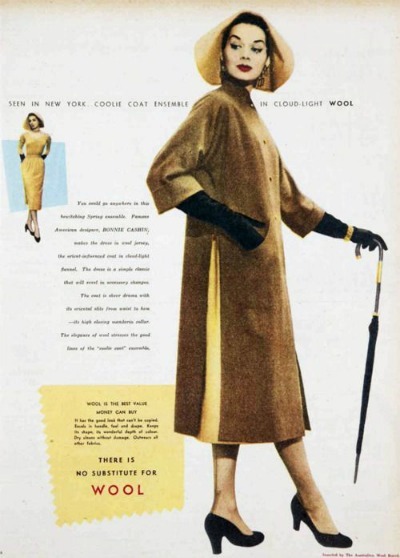 The separates and raincoat worn by Miss Tierney would become Cashin's signature looks. 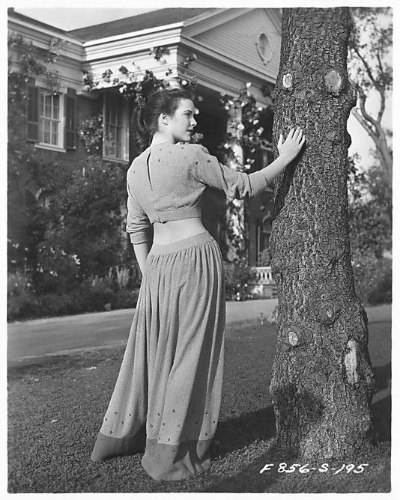 She reportedly said of her time in costuming, "I wasn't designing for fashions, but for characteristics, which is the way I like to design clothes for daily wear." It was after her return to New York and a brief interim at Adler & Adler that Bonnie Cashin Collections began to gain notoriety. 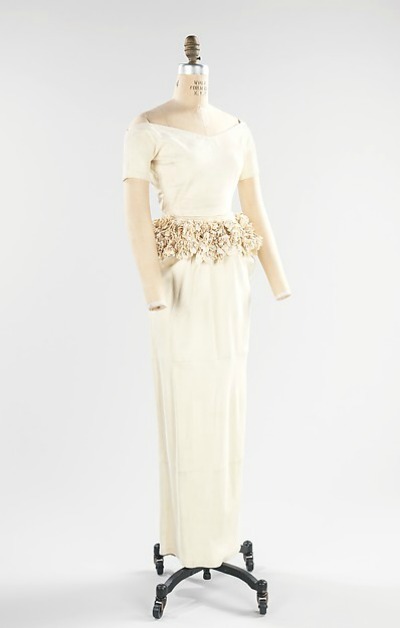 She was awarded the first of her four Coty Awards and a Neiman Marcus Award in 1950. Fiercely independent, Cashin's left Adler & Adler in 1952 to open her Bonnie Cashin Designs studio. She never used a design assistant, preferring to oversee each creation from sketch to production. The use of leather as a component in both fashion and interior decorating during the 1950's was in vogue. Few mastered the look as well as Cashin. 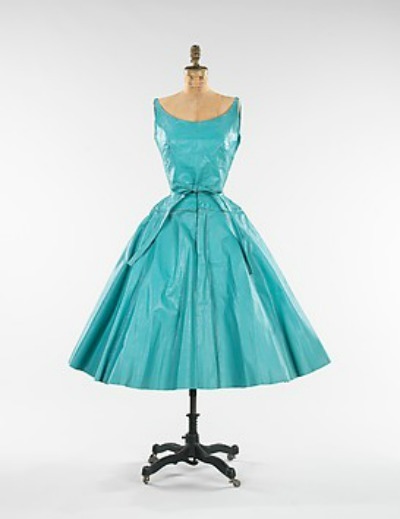 Cashin designed the leather wedding dress above for the "Leather Originals Gala," a ballet performance and fashion show, presented by the Leather Industries of America at the Brooklyn Museum in July of 1953. Traveling widely during her career, Cashin closely studied the traditional clothing worn by various ethnic groups. 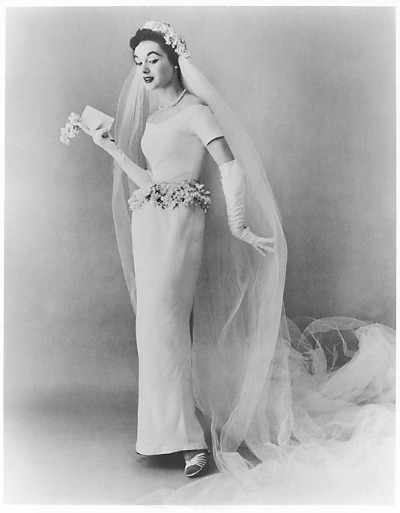 Her designs resonated with their fabrics, composition, and form. Cashin used her interest in the Asian society and traditional clothing to form garments with cultural accuracy yet unmistakably American. 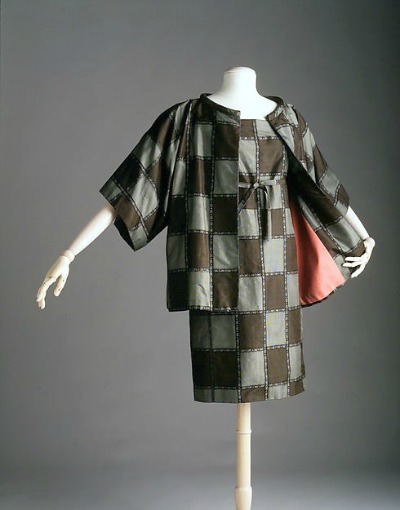 This also influenced her adoption of the ikat method of resist dying to affect the complex woven textile of the quite simply made ensemble shown above. 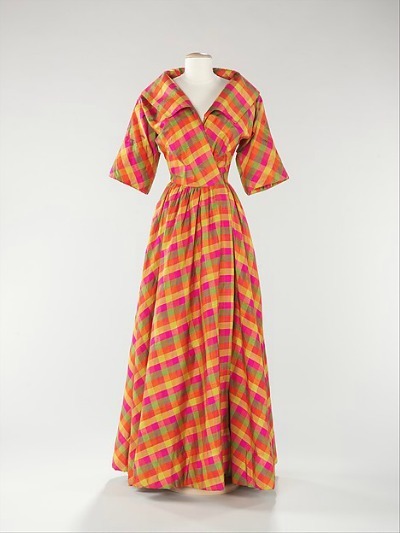 Cashin's propensity for vivid colors in her designs is evident in this fuschia, orange, green, and yellow evening dress. Insisting on total creative control, Cashin collaborated with companies such as Bergdorf Goodman, Samsonite, and White Stag. Perhaps her most notable alliances were with leather maker Philip Sills and with Coach leather goods. Feeling she would not have the autonomy she demanded, Bonnie Cashin chose not to license her brand. Neither did she patent the distinctive Coach bag design. Bonnie Cashin's motto of "Chic is where you find it" remains relevant today.